The Hopi Blue Star Kachina appears again! The final sign before the Day of Purification! In Frank Waters's writings on Hopi mythology, the Blue Star Kachina or Saquasohuh, is a kachina or spirit, that will signify the coming of the beginning of the new world by appearing in the form of a blue star. The Blue Star Kachina is said to be the ninth and final sign before the "Day of Purification", described as a catastrophe or a "world engulfing cataclysm" that will lead to the purification of planet Earth. 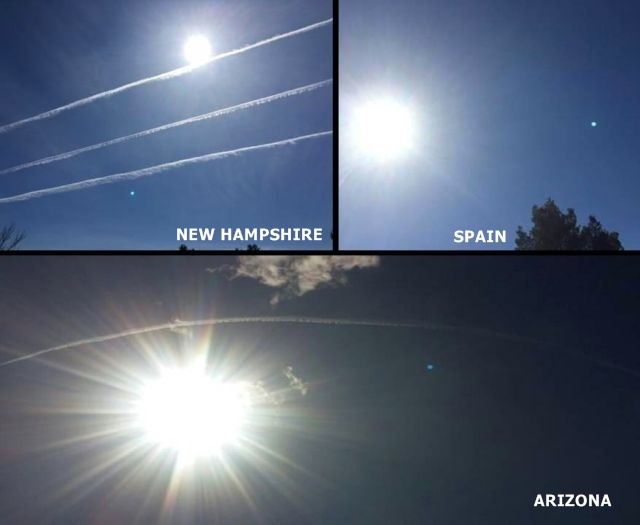 Last month a strange blue star or planet was seen in the skies over Arizona and Spain. (See our article: Blue planet-like object appears in the sky over Arizona and Spain ). Now, Dave longtime reader of UFO Sightings Hotspot sent us an image of the same blue object which he captured in the sky over New Hampshire about two weeks ago. This resonates with me, a lot. Being of Native American descent I cannot discount this prophecy of the Hopi nor any other tribe. A Shaman has no direct course of manual to go by but those instructed and honed with the ability cannot be described in white man's terminology or vernacular. What you've got there are three obvious chemtrails as well. Doesn't anyone care about that? When we take into consideration that there have been two celestial bodies traveling kind of close together their prophesy makes total sense. I think I read that astronomers found them a while back and just let the public know abut them. Then there is what the astronomers call Planet 9. That coincides with what the Hopi call the 9th world. I feel the changes in my soul. I cry now with compassion for those lost, myself included. I'm pretty sure this is simply a lens flare- but the chemtrails are disturbing!! Pretty odd that the lens flares are happenign all around the world from Qld to England to Arizona Spain??. Ozziegirl, that would not be odd at all but more likely to be proof. In other words anyone can make a mistake with a camera...anywhere in the world. I am not discounting the prophecy, just the symptom or lack there of. This will also raise the Ire of many, but orbs are not photos of spirit beings since there is a lot of proof that they are photo mishaps and of course..around the world. I just caught the blue star on my camera this morning and I live in NM. There also happened to be major chemtrails going on as well..
My wife captured a photo of it to the left of the moon last Saturday night as we headed east on 90 toward Boston. Last night, with an ISO of 800, I got a photo last night in Petersburg, NY. We shall all see in December 2017 when the signs from the heavens show us all. on July 24, 2016 I saw "IT"...I was driving west on I-40 1/2 way between Winslow and Flagstaff , Arizona. It was 8:30 in the morning and I couldn't figure out what it was. I have some knowledge of astronomy and was perlexed enough to pull over to try and figure out what I was seeing. Looking west with the sun behind me, it was about 25-30° ahead of the sun and was slightly to the south. My mind went through every possible logical explanation I could think of but ultimately it just made my jaw drop. Since then I have been nearly obsessed! I have taken 1000's of pics and I know lens flares! "IT" was not! I was so dumb-founded, I didnt even think to get my cell phone out and take a pic! If and when ANYONE sees it, it will change your whole perspective as to what we are possibly up against. It is humbling! know what it is but it is. or what I should call it, but I live in the land if Native Americans so BLUE KACHINA works for me. (A rose by any other name is still a rose)! in N. Arizona.... don't know what what means, but I think we should pay attention. I want to see a picture with the blue dot but without the sun or moon in it. It seems to be some camera fault due to the sun being in the shot. 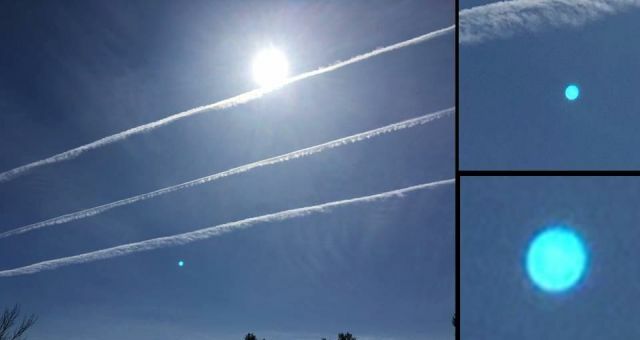 If we see, with our own eyes, an object in the sky and then take a pic of it, how come people are blaming camera faults on the resulting photographic image? If we see a blue star then we see a blue star and the camera has nothing to do with it.